New and shiny. Google Chrome. Just when I was wondering what the folks at Google were upto other than raking in the moolah – they have come up with their own web browser – based on the Webkit rendering engine (the same used by Apple Safari and Android for mobile phones). More impressive than the browser itself of course has been with the speed with which almost everyone I know has already heard of it. It has only been a day since the official beta release…and there is already a full fledged Wikipedia entry for Christsakes! And a full comic book. And youtube videos. And not to mention a Chrome download link on http://www.google.com. Now about the browser itself. It took around 6 minutes to download itself and install. It was a silent install and I had no idea what was installing where…(one would think that I would be used to that with Windows…but no…I like seeing what is happening on my computer!) Once it was installed…it asked me if I wished to import my bookmarks, history, passwords etc from IE. Wonder why it didn’t detect Firefox… most of my work happens there! Then I clicked on the new chrome icon (i don’t like it) to start the program. It loaded almost before I released my mouse button! Less than two seconds… that is faster than IE which takes around 3 seconds, Firefox (5-6 seconds) and Opera (5-6 seconds). Guess it has to do with the term that has come to be associated with Google…simplicity. The GUI is attractive..but still barebones. Ok…now lets see how it renders webpages. I opened Grimescene itself. No problems…images were rendered beautifully…and there were no alignment or placement issues. 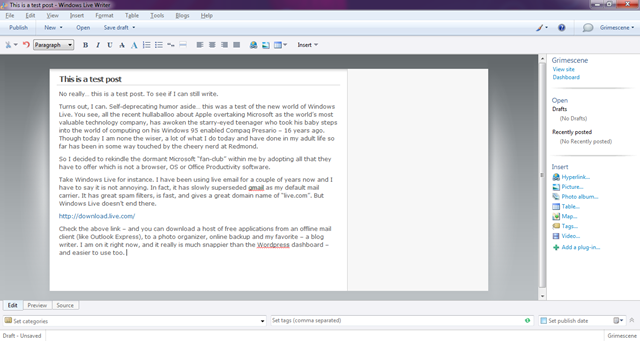 I decided to up the ante a little bit – and opened the new complicated Windows Live mail (mail.live.com). Hmmm…the broadband version which uses sophisticated HTML and some MS technologies didn’t open. In fact it asked me to “upgrade” to a better browser like Internet Explorer, Safari or Firefox. 🙂 Now lets test gmail…it didn’t open! Err… just to check if the site was up I opened the same in IE…no problems! So why wouldn’t a Google browser open Google mail? Maybe it is a problem on my PC…if any of you don’t have this problem…let me know. I opened http://www.gowebtop.com – which is a flash and Ajax based free email – and that rendered without a hitch. What about the other changes? Again…the options and menus are very very basic compared to IE or Firefox. But I realized…whatever I wanted or used daily was there. Google designers and engineers are masters in cutting down stuff… One interesting bit I saw was a “Incognito Browsing Mode”…where what you do there does not appear on any records. I can imagine where people are going to use that one…heh heh. Another interesting bit is the default “dashboard”. Everytime you open a new tab it shows your browsing history in a nice visual manner…they call it the visual homepage. Quite convenient. But before you start showering awards on them…let me remind you that Opera has had this for sometime now – though it’s not based on browsing history. Google Chrome also gives Other important browing information on the right – and in something called an Omnibox on the top…which is again borrowed from Opera. Verdict. Havent used it too much…but I don’t see why someone can’t use it as their default browser. It is fast and renders most of the pages I visit, including streaming video or flash based sites – pretty competently. But is it a breakthrough? Most probably not… Opera (though a little slower) has had many of these so called new features for sometime now. But the brand name of Google is much much bigger…and I expect crowds thronging to download this new toy from the most famous name in the business of the internet. P.S. : This post was written on Chrome. It works!! Update: A good friend from the far east confirmed that Gmail works on Chrome. Must be a local issue then. All I was doing was opening a pdf file in another tab. Google engineers…feedback for you. PDF is important. Pls fix it!